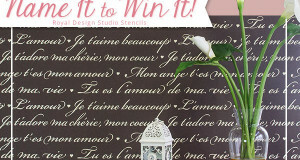 The winning stencil name was Persian Garden Damask Stencil suggested by Christine Carino. 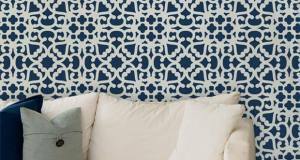 Find the Persian Garden Damask Stencil on Royal Design Studio. Your favorite ‘Name it to Win it’ is back! We have designed a gorgeous new stencil to add to our Damask Stencil Collection. This beautiful pattern will not only help you deck the halls during the upcoming holiday season, but is designed to bring elegance to your home throughout the year. Its free flowing floral pattern can give a graceful, feminine touch to any room, furniture or craft project. We know you are eager to get your hands on it! But before we make it available, we need your help in finding a perfect name for this stencil. 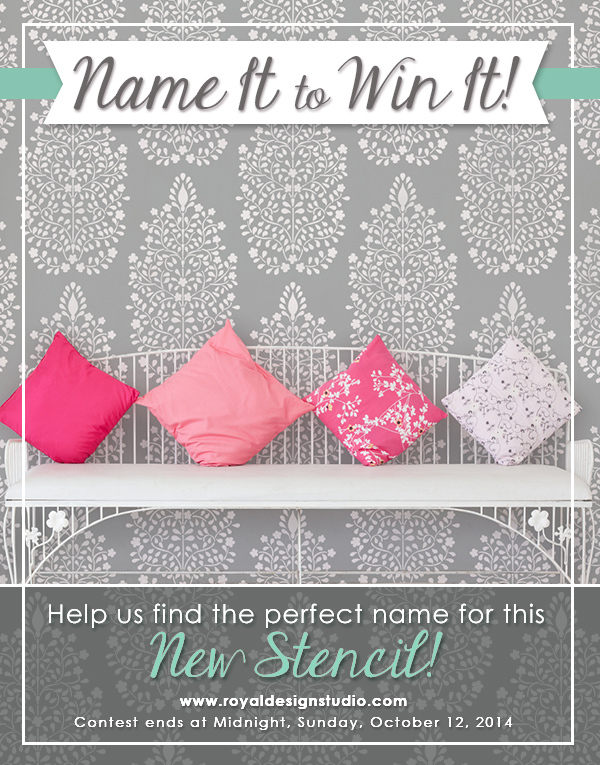 From all of the responses to past contests, we figured our best stencil names come from you guys! So, Hurry! Leave your best name suggestion in our comments section below before midnight, Oct 12th. If we PICK it, you WIN it! Good luck! Has a Downtown Abbey feel to it. My first thought was tree of life. I see that other people thought so too! Pinecone Damask is exactly what I was gonna say, but I see someone already said that! This is lovely! I’d name it “Queen’s Ransom”. It is very delicate; I would call it” Lady Arabesque”. This is such a lovely, soft stencil. I would be honored to win it. Thanks for these wonderful opportunities. This stencil is magical! My first thought was, “Refined Elegance” or “Genevieve,” but after realizing the floral pattern resembles a Christmas Tree when you look closely, the name “Glad Tidings” or “Hope,” came to mind. Filigree Definition – Delicate and intricate ornamental work made from gold, silver, or other fine twisted wire. An intricate, delicate, or fanciful ornamentation. A design resembling such ornamentation. My immediate thought was TREE OF LIFE. Parisian Glam for the new damask stencil!!!! (= a thousand flowers, in French). “Malala” after our newest and youngest Nobel Prize winner. When I saw the new pattern I thought, “Arabic” and “magical”, hence, “Djinn Damask”. A djinn is a genie, as in “Your wish is my command”. Chantilly – the quintessential feminine floral lace, a perfect damask pattern. Filigree of undulating vine flowers. These remind me of the floating Chinese paper lanterns the way they r laid out/grouped together. In their culture paper lanterns were used to celebrate Taiyi…The god of Heaven, in the hopes of bringing good fortune to its people, as he was believed to control the destiny of the human world. Cosette – It makes me think of the garden where Cosette sees Marius (Les Miserables). The top of this beautiful stencil looks like an elegant light shimmering off of a vintage gate with climbing flowers. It reflects softness, charm and sends a softness throughout. How about Reflections of Grace Damask? I aƄsolutely ove your blog and find almost aⅼl oof your post’s to Ƅe jᥙst whatI’m looking for. Would yоu offer guest writersto write cοntent available for you? I w᧐ulԁn’t minndpublishing a post or elaborating on a few of tһe subjects you write with regards to here.Again, awesome websіte! This design is steller! You definitely know how to keepa reader entertained. Between your wit and your videos,I was almost moved to start my own blog (well, almost…HaHa!) Wonderful job.I really enjoyed what you had to say, and more than that, how you presentedit. Too cool! My partner and I stumbled over here from a different webpage and thought I might as well check things out. I like what I see so i am justfollowing you. Look forward to looking over yourweb page repeatedly.